Many shoreline communities are moving away from the use of rock revetment structures as a solution for controlling beach erosion. 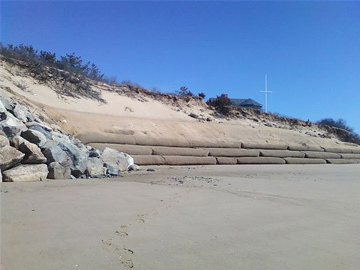 The reasons are many but generally focus on the fact that it appears that rock revetments accelerate beach erosion, and can be detrimental to properties up-drift and down-drift from the rock structure. As a result, many homeowners with shoreline property exposure are moving towards use of soft, bio-degradable shoreline protection in conjunction with annual beach (sand) nourishment. One case in point is a private residence in Wellfleet. 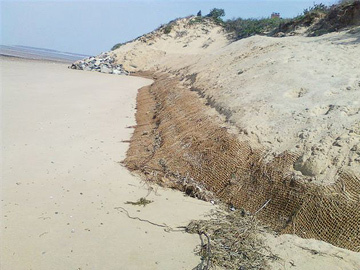 A four terrace coir envelope coastal bank stabilization program was developed to slow down the rate of erosion of the coastal bank. As part of the Conservation Commission approval, the property owner was required to place beach compatible sand on the coir envelopes at the same volume that would be taken by wave and surf action during the course of the year. 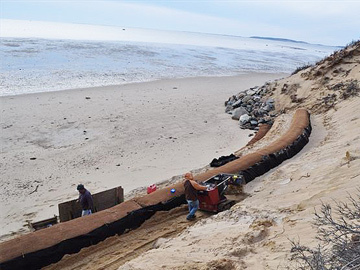 The result is a shoreline protection program that absorbs rather than reflects wave energy, is more compatible with the existing shoreline dunes and coastal bank, and continues to supply sand for on-shore/near shore coastal processes.